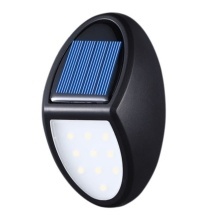 This product is a solar powered lamp, small but bright, waterproof design suitable for outdoor use. Densely distributed 10 LED lights provides super bright light with maximum 600 lumens. This outdoor solar light would absorb the sunlight and convert into electricity at day light. And super light will come on automatically turn on at night, no need to control the button of light manually. Adopted polycrystalline silicon solar panel, this solar LED light can provide higher power efficiency, the energy conversion rate can be up to 17%. Splash-resistant design, it can withstand rain splash and dust, water or dust is not easy to infiltrate into the inner body of light.